The Provincial wants “Rekindling the fire” not to be a task reserved only for a few “experts”, but a work for all the brothers. With this in mind, he extended this invitation to them: “Through this letter I want to invite you personally to participate in the Provincial Assembly on Saturday 16th and Sunday 17th September. 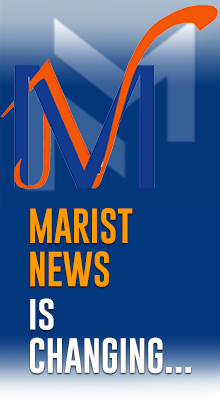 As you know, the central theme of our work will be Marist Vocation Ministry. I invite you, then, to come with an enthusiastic and open frame of mind. The idea is that all the brothers of the Province and of the District give of our best so that we live out this priority rather than simply talk about it. In this sense, your contribution will be irreplaceable. On Tuesday, 21st September 2004, three Nigerian women were the first religious to profess vows in the new Congregation of the Marist Missionary Daughters of the Society of Jesus the Good Shepherd. This new Congregation was born due to the inspiration of Brother Thomas Ezeakku. The newly professed had waited several years before being able to realise their desire to consecrate themselves to God through their vows. From its beginning until the present day, this foundation has received the constant support of the Marist Brothers at all levels of our Institute. 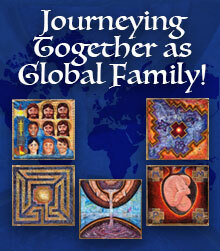 We invite you to pray for the development of this new religious family. Brother Giovanni Bigotto has submitted to the Congregation for the Causes of the Saints ten copies of the “positio” of Brother Laurentino and his forty-five confreres murdered at Barcelona on the 8th October 1936. The positio is the demonstrative work of the martyrdom of this group of brothers. It is a work of more than 1000 pages, completed by Brother Gabriele Andreucci to whom is due all the honour. The submission of these ten positio means that, in November, the theologians are going to start to examine the cause so as to vote in January 2005. The meeting of the Cardinals and Archbishops will follow later, April – May, and then there will be the reading of the decree on the martyrdom June – July. After this, all that needs to be done is to wait for the date of the beatification. A booklet on this group of martyrs will appear in the coming months. It will be similar in style to that of Brother Bernardo, which is already available to the provinces that ask for it. Among these martyrs, we have people of an exceptional human stature, who deserve to be known and of whom we, as Marists, can be proud. This is an enormous spiritual capital and it would be a great pity if we were to be unaware of them and not hold them in our heart. The Provincials have nominated brothers who are responsible for sending notices for the web page. Brother Onorino Rota, Director of Publications, extends a personal invitation, not only to them but also to all the brothers, to send news items (and if possible accompanied by photos) to publica@fms.it to enrich our web site. This is an effort to “advertise the life” and to make known the richness of the Institute throughout all the world. Many brothers have asked to be able to use the photos that appear in the last FMS Message, which are a reproduction of a mural by Goyo. We remind everyone of what is written on page 2 of the magazine: the Collegio Chamberi di Madrid holds the rights to these. The General Council has adopted the Statutes of the District of África del Oeste / Afrique de l’Ouest / West Africa, which depends on the Province of Mediterránea. This District has communities and Marist works in six countries: Cameroon, Ivory Coast, Ghana, Equatorial Guinea, Liberia and Chad. The Province of Melbourne held its 13th Provincial Chapter from the 27th to the 30th September and this marks the start of the second mandate of Brother Paul GILCHRIST as Provincial. The Chapter nominated five brothers as Provincial Councillors: Brothers Tony CADDY, Julian CASEY, Tony CLARK, Paul KANE and John Mac Mahon. The Province of Sri Lanka and Pakistan has just held its 16th Provincial Chapter on Saturday, 2nd October. This marks the start of the second mandate of Brother Mike de WAAS as Provincial. The Chapter nominated the following four brothers as Provincial Councillors: Brothers ALWIS Sunanda, LYANAGE Sunil, PERERA Mervyn and FONSEKA Noël. Two brothers and one layperson have opened a Centre called “The Small Farm” to help with the social reintegration of a group of young people. They hope to achieve this by living with them, by being close to and accepting of them and by sharing in the daily tasks with these young people. More than 30 years have passed by, but the little girl is still running, crying and screaming. She is wearing nothing, fear is her clothing. Behind her, a dark, threatening cloud is advancing, a cloud of napalm. The little girl is nine years old and her name is Kim Phuc. Her village is Trang Bang, which is a few kilometres from Saigon. It is during the period of the “dirty war” in Vietnam. The photo is only the starting point. Kim survived and now she is able to find the courage to show us the terrible scars that the napalm left on her skin. But she repeats ad nauseam that the more terrible wounds are within her. But this has not prevented her from growing, from loving life, from becoming an ambassador of peace for UNESCO. It is her face, her grit, her dynamism that tell us that she has made it! A month has passed by since the tragedy of Beslan. The children shown to us by the media during this time resemble little Kim very much. From the bottom of our heart we sincerely hope that all are able to survive this, to cope and to be able to continue to love life. I, you, all of us… we can do something for the children of Ossetia, for those who live in our area, for those who live alongside us, to overcome hatred through love! Luján is not only the spiritual capital of Argentina, but also the first link in a chain that, throughout a whole century, has linked together some of the most diverse places in the country, thanks to the untiring work of hundreds of brothers and lay people. The celebrations started in September. As noted in one of the best-known newspapers of the city, we are celebrating the centenary “in humility, modesty and simplicity” following the manner of our Founder. The festivities brought together brothers from various communities, authorities from educational, political and religious domains, former students, their teachers, flag bearers representing the local schools and Marist colleges of the Province of Cruz del Sul and a crowd of parents. One of the most moving moments of the celebration was when the mothers who are catechists and their children who are preparing for their First Holy Communion carried in the picture of Our Lady. This procession was accompanied by the singing of present-day students and former students. Mary and Saint Marcellin were given pride of place in this ceremony. We chose the Education Day to commemorate this special event of the centenary and to pay homage to those who have dedicated their lives to the sowing of the seeds of love in educating children and young people. At the end, one hundred doves and one hundred balloons carrying the logo of the celebration “One Hundred Years with Mary and Marcellin” were set free into the sky. This was a mark of gratitude towards the first brothers who, in 1904, started this educational work and made it possible for the Collège Notre-Dame de Luján to become what it is today. The brothers from the communities of the city of Buenos Aires and nearby areas came together to celebrate Our Good Mother. At midday, more than sixty brothers gathered around the altar on the huge property of the Senior Brothers’ Residence, Villa Champagnat, at Pilar. This was a time of prayer and praise to the glory of our Good Mother, asking for her protection. We were also privileged to have amongst us some younger brothers from communities from further inland. These brothers were spending a day at Luján. It was a time for sharing different experiences, recent memories and also memories that were not so recent. The presence of the older brothers, whose rhythm of Marist life is more tranquil now, was enriched by the vitality of the middle-aged brothers and especially by the joy, openness and eagerness of the younger brothers. It was a time to savour thanks to the prayer led by Brother Eugenio, the presence of Brother Demetrio and the table fellowship that we shared. We then enjoyed the traditional Argentinean roast meal, which was particularly succulent on this occasion, with the appropriate beverages that gave great cheer to all. It is great when you can share with other brothers at a table ringing with screams of laughter. After the meal, some small groups went for a walk, some played cards and some discussed their plans for the year. We regained our strength again, under the tender care of our Mother, to continue with our task of building together a province renewed in the light of the Southern Cross (Cruz del Sur) and in living the dream of Saint Marcellin. A workshop on Vocation Ministry for the Asian region took place in Sri Lanka during the month of August 2004. The brothers responsible for Vocation Ministry in the Province of Sri Lanka and Pakistan, the Province of China, the Province of the Philippines, the District of Korea and the Sector of India took part in this workshop. The workshop was facilitated by Brothers Théoneste Kalisa and Ernesto Sánchez from the Vocation Ministry Commission of the General Council. The group of thirteen brothers worked intensely for a week, enjoying times for sharing, prayer and relaxation. The first days looked at Vocation Ministry in the present day context of young people, of society and of Marist life in Asia. In the majority of countries in Asia, the presence of Catholicism is a minority presence, with the exception of the Philippines. This in itself presents a challenge to the Christian way of life as well as to Marist life. The reflection continued throughout the week, searching for possible lines of action suggested by the studied reality and the calls of the 20th General Chapter. The brothers tried to come up with concrete ideas that were in accord with the plans of each Administrative Unit. Ideas and plans for the Marist Vocation Year were also shared and time was given to two important themes: the accompaniment and the discernment of vocations. A special occasion was the celebration of the Eucharist and the sharing of a festive meal with the brothers of Sri Lanka who proved to be great hosts. Their family spirit was readily evident and keenly shared. From the 10th August, twenty-two Marist Brothers from twelve countries were at Manziana for a spirituality course that lasted two months. The names of the brothers who participated in this course are: Afonso Heck, Antonio Pisco, Benedetto Termini, Bruno Nebreda, Celso García, Enric Boix, Erasmo Alba, Ignacio del Pozo, Isaac Díez, Isaac Revilla, Jaime Juarista, José G. Padilla, Jesús Luengo, José Gpe. Romero, José Luis Gorría, Juan Ortiz, Marco Aurelio Ospina, Néstor Machuca, Pedro Septiem, Quirino Calvo, Timoteo Pérez and Zacarías Aguirre. They were looked after marvellously by Brother David Aranda, Director, Brother Diamantino Duque, Assistant Director, Father Antonio Roig F.M.C. and Brother George Fontana, Econome. Their mission now is to help other brothers to discover the objectives of the course and to live them. *To accept peacefully and joyfully my personal story and the influence of divine grace in my life. *To know how to respond to the calls of the Holy Spirit at this very important time of my life. *To be conscious of the importance of the role of my life and mission in the Institute. *To return to my community as leaven for fraternity, hope and service for laypeople and brothers. As well as conferences given by General Councillors, other brothers and professional laypeople, the group was able to take advantage of a great deal of free time for reading, for prayer, for sharing in small groups and in the whole group and living Marist fraternity in a spirit of joy. The visits to Rome and the pilgrimages to Assisi and Subiaco helped the brothers to be more open to God’s grace as were Francis and Clare of Assisi, Benedict and Scholastica of Subiaco. Other moving moments included the Papal Audience at Saint Peter’s, the meeting with Brother Superior General, the launching of the Marist Vocation year at Viterbo and talking with the Little Sisters of Jesus at Tre Fontane. The beautiful weather, the incredible countryside, the peace and the silence of the place were important elements that helped the brothers to be optimistic, faithful, fraternal and to have confidence in God through the intercession of our Good Mother and our saintly Founder. A university camp was organised by a group of young brothers at “Villa San José”, in Luján, at the feet of Our Lady, on the 25th and 26th September. The participants were former students of Marist schools, who work in Pastoral care in some of the colleges in the capital city and other parts of the country. There were twenty-five university students in total, accompanied by five young brothers. The theme of the two days was “Taking on the heart of Marcellin”. The aim of the camp was to come to a better understanding and appreciation of Marcellin’s charism, his dream for the Little Brothers, his spiritual growth and how this dream can be a reality for each young person who hopes to live a life of service according to the Marist charism. They started with integration activities that helped them to work on two themes: “Inheritors of an inextinguishable fire”, with a time of silence for personal reflection followed by a reflection on the document “A Revolution of the Heart”. This led to a reflection on Marcellin’s dreams and everyone’s personal dreams. A talk was given on the Founder’s way of discerning a vocation and on his spirituality. The arrival of spring encouraged everyone to be renewed in fresh ways of being present to the children and young people with whom they work. This experience was a special time of song, of games, of laughter, of prayer, of celebration and of table fellowship. Brother J. Jesús Sánchez Cobián was born in a little rural town in the south of Jalisco, San Juan de Amula, into a profoundly Christian family who worked on the land. When he was two years old, his father died. From this moment on, the young Jesús started working on the land. That same afternoon, I went to see the priest and he told me: “This is stupid! It is better to go to the seminary at Colima with your brothers.” I answered: “To be a priest? No!” We spoke together for some time but we only repeated the same things. Finally I said: “I am going, you do not want to help me.” At this, the priest responded: “When Brother Pedro Damián comes here looking for vocations, I will tell you so that you can talk to him about this.” I thanked him and waited for his news. A few days after, the priest called me and told me that Brother Pedro Damián was here and that it was possible to see him and talk with him. 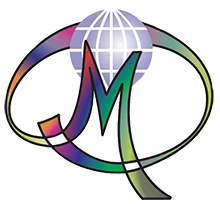 “Marcellin’s dream: Live it today!” – was the catchcry used by the school community of the Medianeira de Erechim (RS) School in Brazil for the official opening of the Marist Vocation Year. Throughout this year, this community hopes to come to a deeper understanding of the meaning of life and of vocations in the world, and to make “Champagnat’s dream” come true. The activities started on the 8th September, the official international launching date. This topic was discussed during Religious Education classes and during times of reflection organised by the Religious Education Department. The logo, vocation prayer, the motto and the stages of formation for Marist Brothers were explained. Every group visited the Computer Room to access the Province Internet site on vocations in order to come to a greater knowledge and awareness of the Marist Brothers’ lifestyle. The climax of the activities occurred on the 5th October when each group presented the results of their work. The students from the Infants school danced to the sound of music. The theme Fisherman for Christ referred to the Marist Brother’s commitment to Christ. The students from the Primary school presented the logo, the motto, a prayer and the call that Jesus Christ makes to every young person in their vocation. The students from the Secondary school, after having studied and discussed in class each of the four stages of Marist formation, presented them creatively through short plays to show the stages of the Juniorate, the Postulancy, the Novitiate and the Scholasticate. This was a very special moment during which the students could better understand the life and daily activities of a young person wanting to become a Marist Brother. Let’s continue to live Marcellin’s dream! Brother Andrew Sikelo made his perpetual commitment on the 2nd October 2004 in the St. Louis Montfort Parish church in Balaka. He is an elder son in a family of eight and comes from the Mwanga Parish in the southern region of Malawi. He did his secondary schooling at the Mtendere Juniorate (now Marist Secondary School). Monsignor Joseph Kimu VG presided at the Eucharistic celebration, which was concelebrated by many other priests from the diocese and the religious congregations working in the diocese. In his homily, Monsignor Kimu compared the commitment Brother Sikelo was making to an African woman’s service for her family. She looks for three stones, sets them properly with firewood in between to prepare food. Brother Sikelo is to serve the Lord through the three vows. Monsignor Kimu also expressed his gratitude to the Marist Brothers for the wonderful work they do in the diocese. He appealed for more brothers to come and work in the diocese. This perpetual profession was another opportunity to share Marcellin’s dream with others and a good way of promoting vocations to the Marist way of life. The young Religious of Guatemala met to celebrate the First Congress of Young Religious Life, with the theme “Something new is being born”. Ninety-six Religious, from thirty-seven different communities and charisms, came together on the 8th, 9th and 10th October, at the invitation of the Youth Commission of the Conference of Religious in Guatemala (CONFREGUA). The meeting took place in the Marist Residence, in the capital city of Guatemala. Many sisters travelled from various parts of the country and others came from mission houses in El Salvador and Honduras. They enjoyed meeting each other, living together for a short time and sharing the dreams that the Consecrated Life holds in today’s world in these lands of Central America. The Congress also gave the young Religious the opportunity to share their charisms, to give thanks to God for their vocation, and to pray and reflect together so as to think about the challenges they face and to place Jesus of Nazareth at the centre of their lives. By doing this, they hope to give greater witness to the Gospel in today’s world. The meeting was held in a fraternal atmosphere, marked by youthful happiness and an international touch (the participants came from fourteen Latin American nations). Six Marist Brothers in the post-novitiate stage of formation participated in the Congress while another two brothers contributed through accompaniment and by developing the themes for reflection. Religious Life in Guatemala feels revitalised through this youthful experience and called once more to be a living witness of the presence of Jesus of Nazareth in the various day-to-day realities of our world. On the 1st July 1994, Brother Chris Mannion was killed in a country that was then witnessing horrific events, which must still be painfully etched on the minds of its people. Now, ten years later, Chris’ death can serve as an inspiration to us to reflect on the random and senseless violence that still prevails in the world. May his death deepen our own conviction and inspire us to strive to convince others too that violence will never lead to peace. This is best summarised in the words of Psalm 85: “Peace is the fruit of justice.” To promote justice is our main task and it is the only way to bring about peace. The General Council wanted to remember this anniversary by printing a small booklet “ONCE ONLY” which is a short collection of some of Chris’ writings. “More and more I’m convinced that it isn’t length of life which is important but the passion and commitment with which you live it. This life is a gift to be enjoyed, to be used to the full precisely because it will end in death (MY DEATH!) one unforeseen day. I must live this gift of life now without worrying what will be afterwards. God in His mercy and goodness will take care of that. If I worry so much now about ‘going to heaven’ or not, then I will not be able to engage fully in the here and now. If I dont, then what is the purpose of the Incarnation? Questions of death and the meaning of my life and living it to the full are coming up a lot these days. What is that saying to me? A call to greater interiority, integrity and commitment, perhaps.